Nathan Hale, born in Connecticut on the 6th of June, 1755, was a school teacher who graduated from Yale College. He left his teaching position, to aid the colonial war effort, after he learned about the battles at Lexington and Concord. During the New York battles, General Washington needed someone to find out what was going on behind enemy lines. Nathan Hale volunteered, disguising himself as a Dutch teacher in search of work. 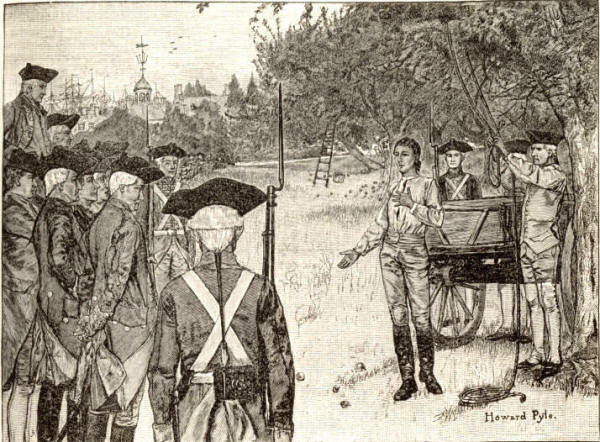 In September of 1776, Hale gathered information (including British troop locations). Before he could provide the materials to General Washington, the patriot was captured on September 21st. General Howe ordered his hanging the next day. It may be that Nathan's Loyalist cousin, Samuel Hale, gave him up. It may be that he was hoodwinked by Major Robert Rogers. Howard Pyle (1853-1911), considered "The Father of American Illustration," rendered his interpretation of Hale's final moments in this drawing. Hale died less than three months after the Declaration of Independence was signed. In response to a call from George Washington he [Hale] volunteered to enter the British lines and procure needed information. At the house of Robert Murray, on the Incleberg (now Murray Hill, in the city of New York), where Washington had his headquarters for a brief time while retreating towards Harlem Heights, Hale received instructions on duty from the commander-in-chief. He entered the British camp on Long Island as a plain young farmer, and made sketches and notes unsuspected. A Tory kinsman knew and betrayed him. He was taken to Howe's headquarters at the Beekman mansion, and confined in the greenhouse all night. He frankly avowed his name, rank, and character as a spy (which his papers revealed), and, without even the form of a trial, was handed over to the provost-marshal (Cunningham) the next morning (September 22, 1776) to be hanged. That infamous officer denied Hale the services of a clergyman and the use of a Bible; but the more humane officer who superintended the execution furnished him with materials to write letters to his mother, his betrothed, and sisters. These the brutal Cunningham destroyed before the face of his victim, while tears and sobs marked the sympathy of the spectators. A thirteen-foot sculpture created by Frederick MacMonnies (1863-1937), and pictured above, faces New York’s city hall and reflects the last moments of Hale’s life. No life portraits of Hale exist, so MacMonnies’ work is his own interpretation. Image, New York City Department of Parks and Recreation. Information, Library of Congress, Today in History - September 22. Linked Above: The story of Nathan Hale appears in the diary of Consider Tiffany, a Connecticut Loyalist. The Library of Congress received the Tiffany manuscript in 2000. It reveals, among other things, how Nathan Hale was allegedly captured - and by whom. Bos, Carole "Nathan Hale - I Have but One Life to Lose for My Country" AwesomeStories.com. Jun 20, 2013. Apr 18, 2019.